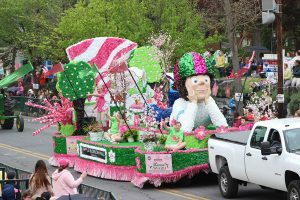 The Shenandoah Apple Blossom Festival is Winchester’s signature event! Each year, hundreds of thousands of people join together to celebrate the arrival of the spring and the apple blossoms blooming in the orchards surrounding the city. Residents and businesses decorate for the occasion and wear the official colors of the festival – pink and green! 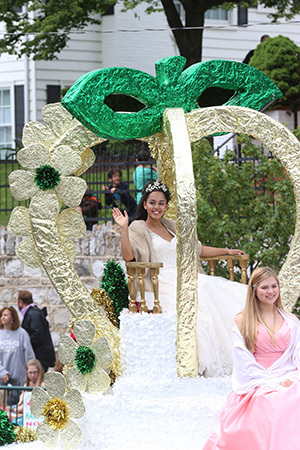 Since its beginnings in 1924, the festival has grown over the years to a ten-day celebration with over 30 events, including two huge parades, a carnival, dances, concerts, a 10K race, wine festival, golf tournament, and so much more! One of the highlights of the festival is the celebrities! Parade goers crowd the streets and attend events to catch a glimpse or get an autograph from their favorites. Past celebrities have included U.S. Presidents, movie and TV stars, famous musicians, and numerous sports celebrities. The festival kicks off with the Bloomin’ Wine Fest, which takes place on the weekend before the main event – the Grand Feature Parade. Visit www.thebloom.com for more information about this exciting annual event!